This is my idea of oatmeal. Smothered with chocolate chips and a hearty dose of peanut butter stirred in. It’s like eating oatmeal in portable form, except better. Because the oatmeal my mom used to make for me didn’t include chocolate chips or peanut butter. 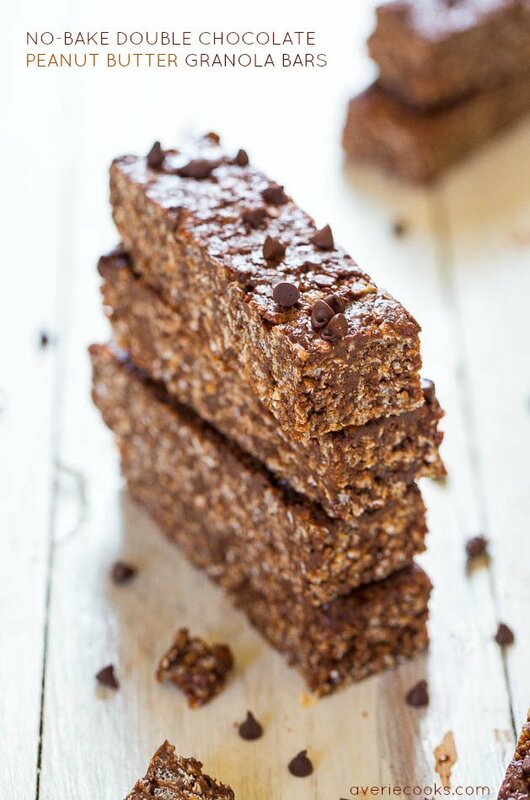 Even though there are extra goodies that you may not normally use with your morning oatmeal, the bars still taste more like breakfast than dessert. If you’re looking for desserts with oats, chocolate, and peanut butter, check out the Related Recipes below. 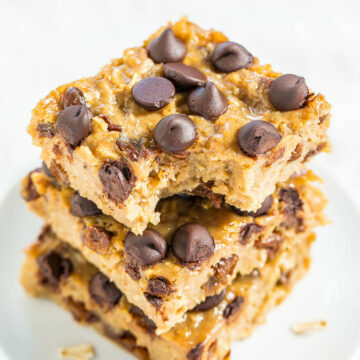 The bars are soft, chewy, and filling. They’re definitely on the denser side and if you’re looking for a hearty, comfort food breakfast, you’ve found it. I added raisins because I love them with oatmeal but if you’re not a fan, simply omit or try dried cranberries instead. I think the bars taste best when warm and I nuke the leftovers for a few seconds before enjoying. But my daughter likes them at any temp and happily goes to town on them in the car on the way to school in the morning or as an after-school snack. This is my idea of oatmeal. 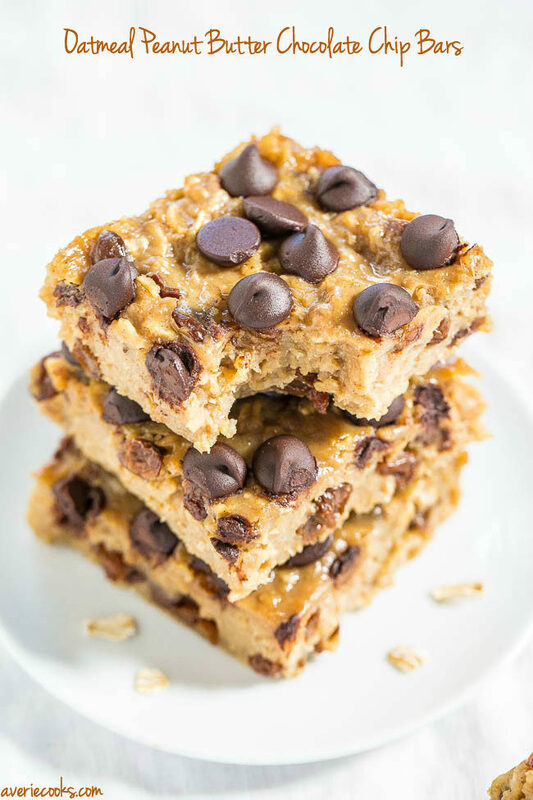 Smothered with chocolate chips and a hearty dose of peanut butter stirred in. It’s like eating oatmeal in portable form, except better, but the bars still taste more like breakfast than dessert. 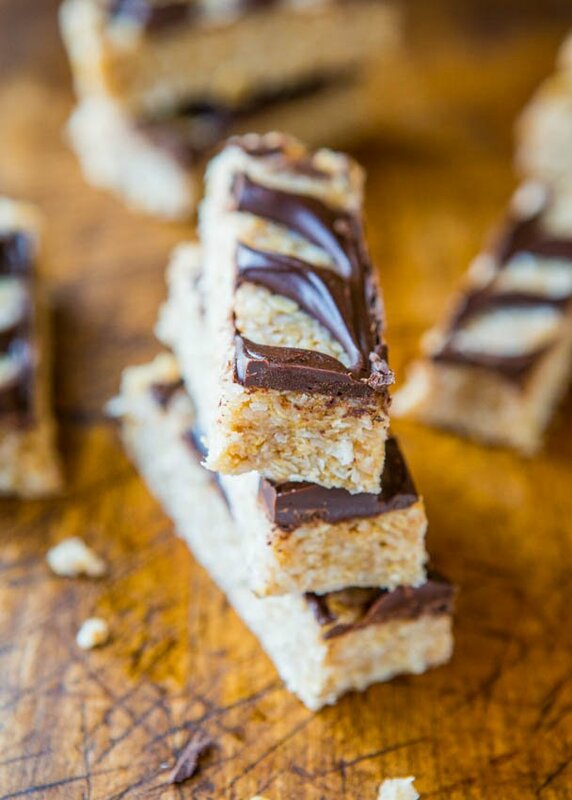 The bars are soft, chewy, and filling. They’re definitely on the denser side and if you’re looking for a hearty, comfort food breakfast, you’ve found it. I added raisins but omit or try dried cranberries instead if you don’t care for raisins. I think the bars taste best when warm but my daughter likes them at any temp and happily goes to town on them in the car on the way to school in the morning or as an after-school snack. Preheat oven to 350F and line an 8×8-inch baking pan with aluminum foil, spray with cooking spray; set aside. To a large saucepan, add the milk, oats (not quick-cook or instant because they behave more like flour and recipe will not work properly), egg, brown sugar, peanut butter, cinnamon, and cook uncovered over medium-high heat, whisking frequently, for about 15 minutes, or until mixture has thickened considerably. If you’re in doubt if it’s thick enough, it’s better to err on the too-thick-side than not-thick-enough. Once mixture starts to boil, allow it to really bubble, making sure to whisk it so it doesn’t form a skin. After about 15 minutes, remove saucepan from the heat, and add the raisins (or another dried fruit, or omit), vanilla, and whisk to combine. Use caution when adding the vanilla because it could cause the mixture to bubble up a bit. Turn mixture out into prepared pan, smoothing the top lightly with a spatula. Evenly sprinkle with the chocolate chips, lightly tapping them down with a spatula if necessary. Bake for about 25 minutes, or until center is set. Baking times could range greatly based on how thick your mixture was on the stovetop, what kind of milk you’re using, oven and climate variances, etc. Bake until your bars are done to your liking, noting that they are very soft bars, shouldn’t be over-baked, and the top will be shiny even when set and done. I prefer the bars served warm and fresh, but extras will keep airtight in the fridge or at room temp (I’m comfortable storing at room temp, store in fridge if you’re not) for up to 4 days. Reheat gently in micro before serving if desired. 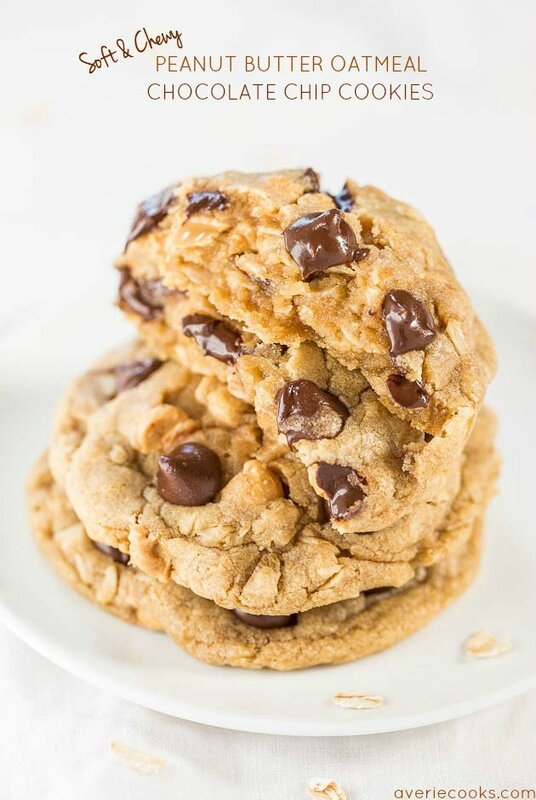 Soft and Chewy Peanut Butter Oatmeal Chocolate Chip Cookies – 3 favorite cookies combined into 1 so you don’t have to choose! Easy, no-mixer recipe, and always a hit! 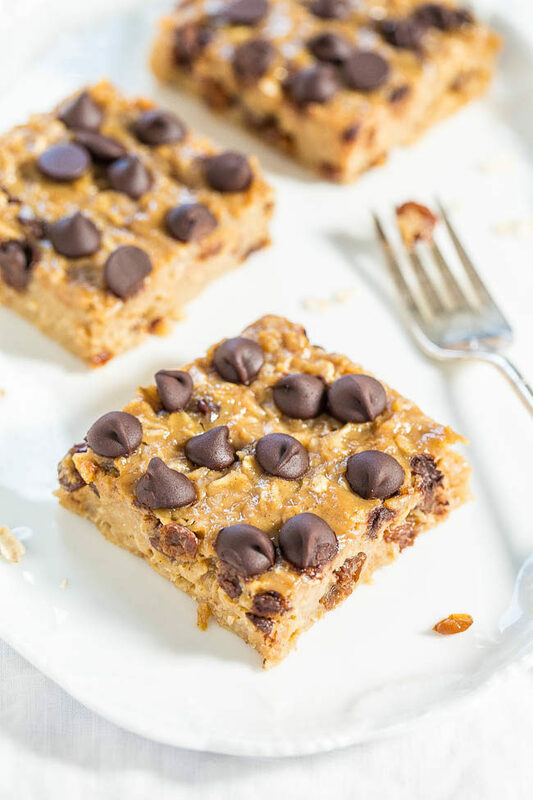 No-Bake Samoas Cookie Granola Bars (vegan, GF) – Coconut oil is perfect in these easy bars great for breakfast or snacks! 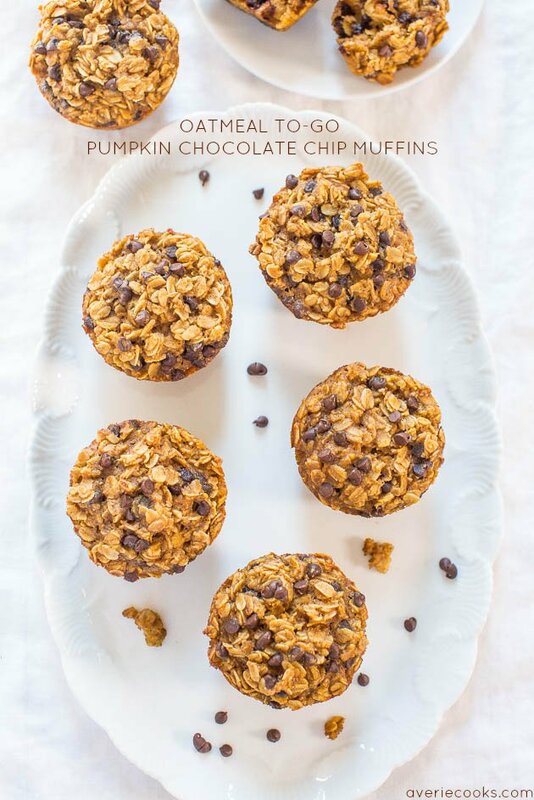 Oatmeal-To-Go Pumpkin Chocolate Chip Muffins – Like having a bowl of warm pumpkin oatmeal in portable muffin form!! Fast and easy! 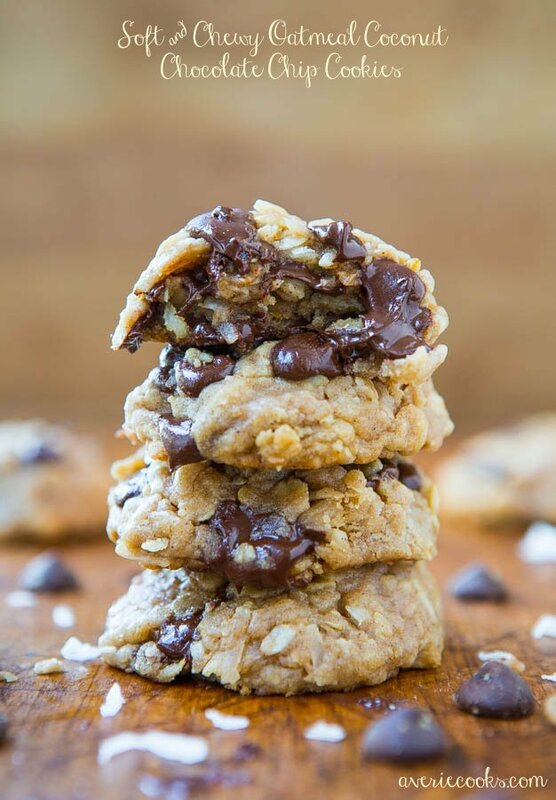 Chocolate Chip Peanut Butter Oatmeal Cookies – A trifecta of favorite ingredients, all rolled into an easy, soft, and chewy cookie! 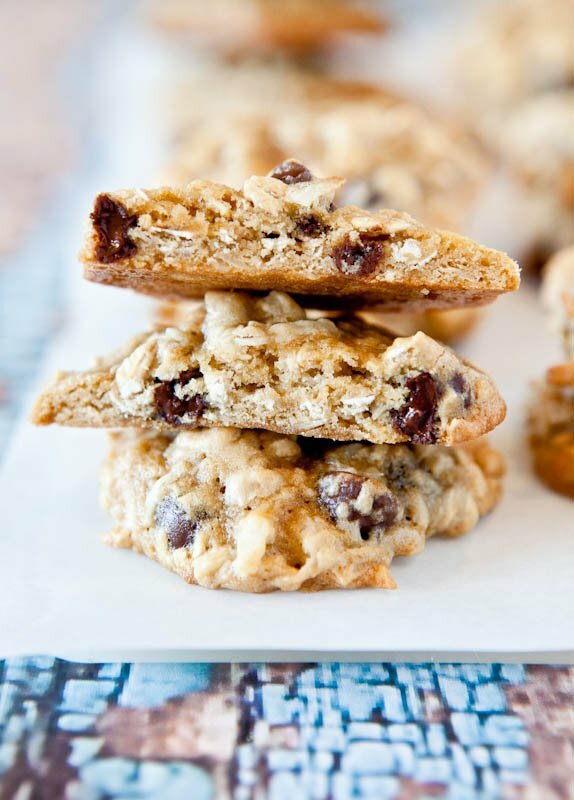 Slice-and-Bake Oatmeal Raisin Chocolate Chip Cookies – A healthier twist on dough-in-a-tube and made with whole wheat flour. 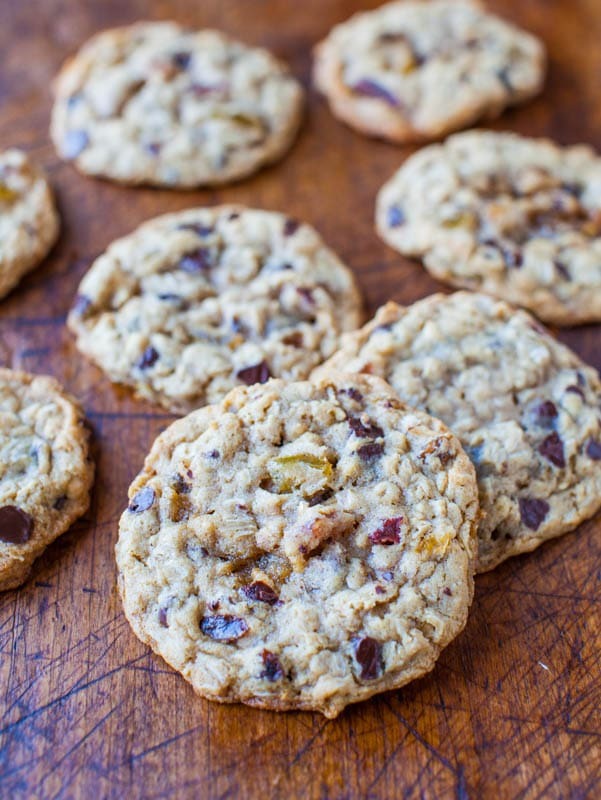 Chewy, hearty, and loaded with chocolate chips! 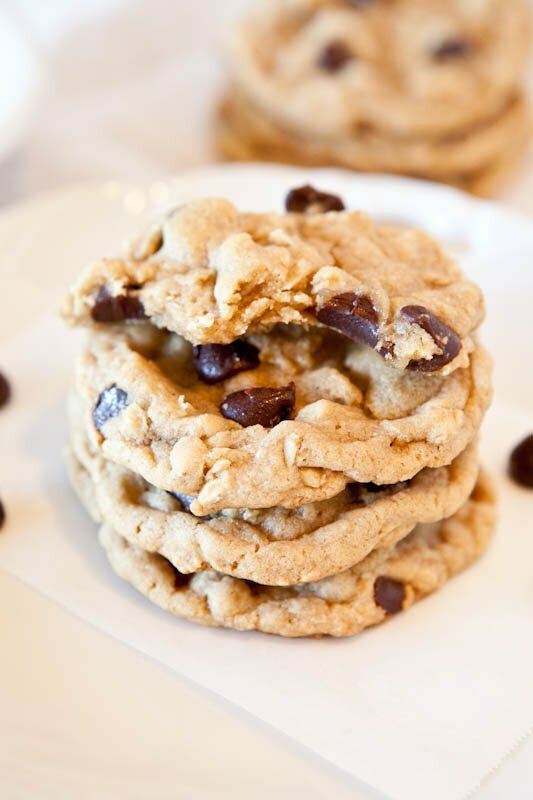 Coconut Oatmeal Toffee Cookies – Add your favorite add-ins like butterscotch chips, white chocolate chips, or raisins to these easy, small-batch, no mixer required cookies! 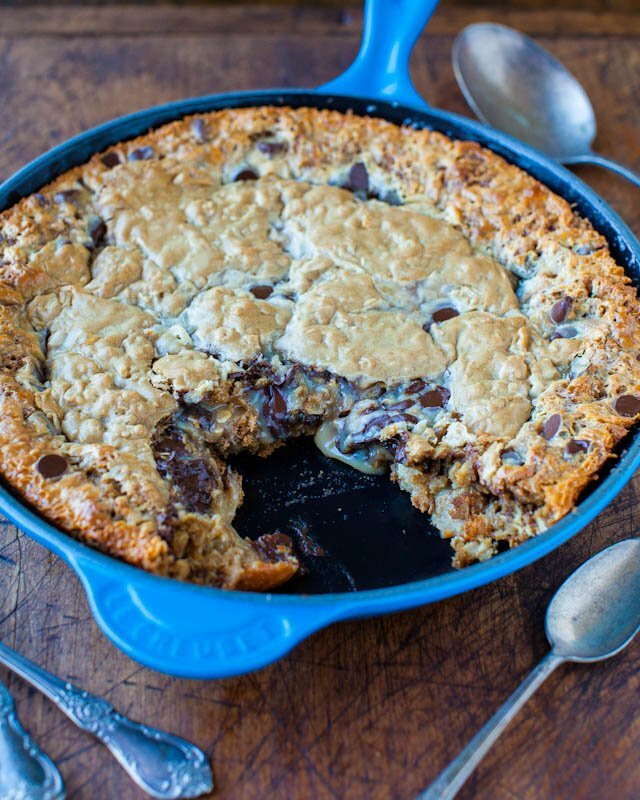 Chocolate Chip Peanut Butter Oatmeal Skillet Cookie – Combining 3 favorite cookies into one! Pop it in before dinner and it’s such an easy dessert everyone loves digging into! ohhh yes this is def. 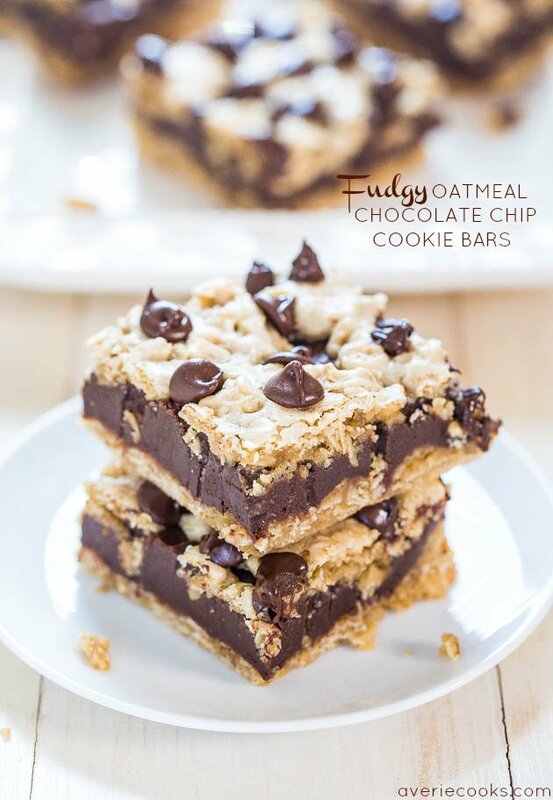 the best way to use oatmeal!!! Making these right now ! May be a dumb question …?…. My baking common sense is about a level 0. Can you freeze these ????? I haven’t frozen them but you’d probably be okay doing that. 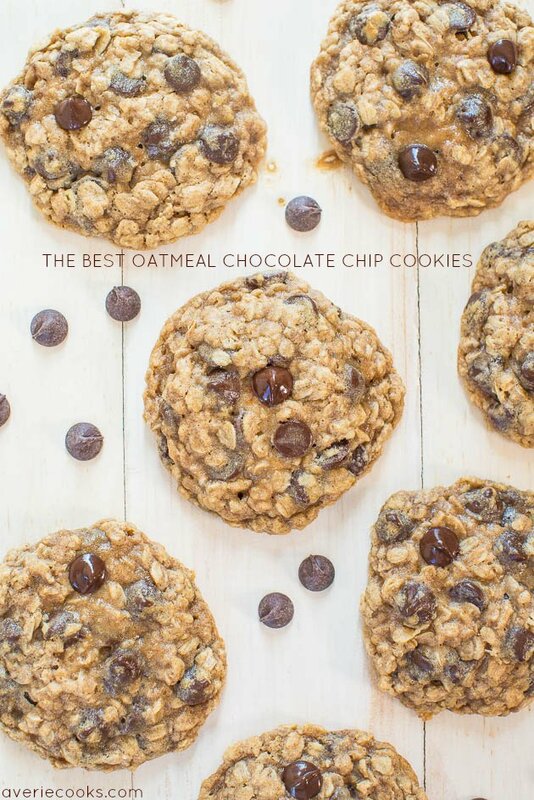 I love oatmeal so I knew that this recipe would be for me. I was right! Made it yesterday and it was great – warm and cold. My kids also liked it (even though the older one doesn’t eat ‘normal’ oatmeal at all). Thanks for trying the recipe and I’m glad it came out great for you! And that your kids enjoyed it too! I made this recipe back when I didn’t yet have an oven, used quick oats instead of whole-rolled and replaced some of the sugar with flour, and it still turned out perfectly! Time to revisit this recipe now that I have an oven! Thanks for the 5 star review and glad this worked well for you even without an oven!